I see, you are trying to muscle in on the lucrative turf of getting your comics linked to from various technical forums. I hope the xkcd crew don’t kneecap you. Damn Randall! But, he missed the most infuriating “oh, nvm. fixed it.”-part. xkcd did it! xkcd did it! There’s something worse than seeing “fixed it, bye!”. It’s when the only result for your search is another person asking the same question… and then you realize the “other person” is you 3 years ago. 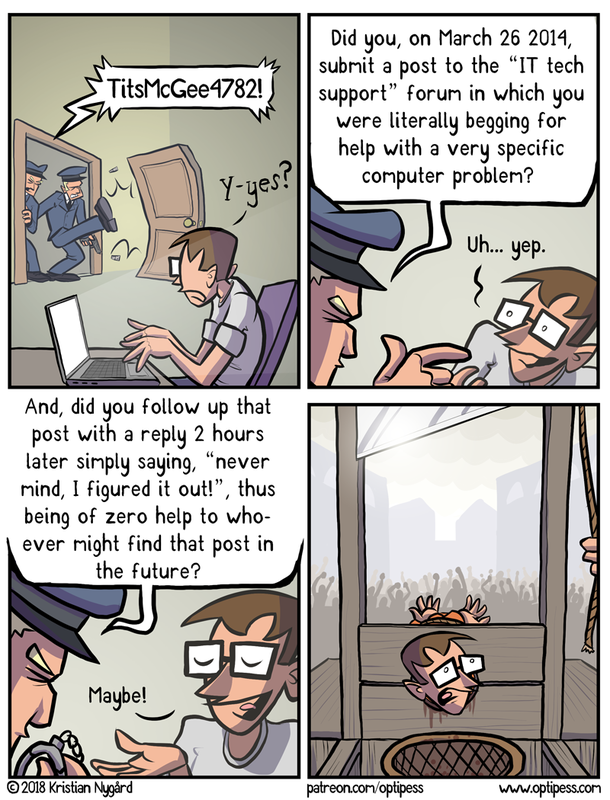 It is drawing a long bow to compare the thread of this gag to the xkcd comic. In mr munroe’s work the message is a feeling of simpatico with an anonymous stranger. In Kristian’s comic, the theme of inquisition, accusation, and execution is not only opposition in feeling, but an entirely different concept. But before you be trollin, remember that the comments thread is archived, there are people who do symbolic logic analysis for fun instead of playing angry birds or whatever it is you waste your lives on. You can track this little tantrum, and see the content gaps of its source when it began, and when you calmed down and started producing content again.